Plant Sale Returns for 2019 Season! The Tri-Village MVCTC FFA chapter will be holding a plant sale for the 2019 spring season. With new improvements and renovations to the greenhouse, the Greenhouse & Nursery Management class will have a variety of hanging baskets, cemetery pots, individual flats, and various types of vegetable options for sale at the Tri-Village Greenhouse starting just in time for Mother’s Day 2019! Over the past few years, the greenhouse has held the primary purpose of plant science projects, agriscience fair and research. With the edition of an aquaponics system, students are able to grow plants in a closed ecosystem that utilizes fertilizing waste from the 350 gallon fish tank. Two research projects were conducted with a partnership of Harvest Land Co-Op to grow different varieties of Corn and Soybeans as well as the invasive species of plants to help train the Yield-Pro Field Technician interns each summer. The greenhouse now has new leuver motors, heater blower motor, speed fan belts and a rebuilt cool cell system across the back wall to help regulate temperatures. 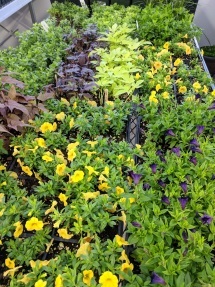 The greenhouse is now full of beautiful plants, ready to go home with you! The Greenhouse Grand Opening will be May 8th, 2019 from 3:00pm to 7:00pm! Come in and buy your lovely mother something beautiful this year, or pick up some hanging baskets for your front porch to make all your neighbors jealous! 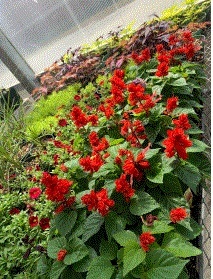 Begonias, Petunias, Vincas, Impatiens and MANY MANY MORE! Start your summer veggie garden off right with over 25 different varieties of Pepper, Cucumber, Tomato and More! Stay tuned for a full schedule of open dates and times! An advertisement flyer and schedule will be available soon on Tri-Village Local Schools website and on Twitter and Instagram @trivillagemvctcffa. We appreciate your support! Tri-Village Agriculture Education Department and FFA Chapter are a satellite program of Miami Valley Career Technology Center and under the direction of Agriculture Educator & FFA Advisor Mr. Justin Slone.